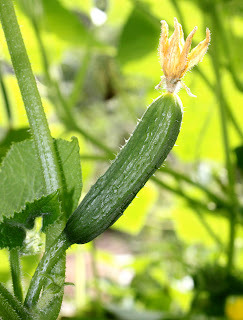 Niki Jabbour - The Year Round Veggie Gardener: How Many Cukes Does One Need??? How Many Cukes Does One Need??? I am loving this time of the year. I know it's cold. And damp. And cold. And we woke up to 10 cm of snow yesterday morning, but the seedlings under my lights keep reminding me that it's spring and soon the garden will be a tangle of homegrown veggies. Plus, we're still harvesting mache, mizuna, mustard, arugula and spinach from the cold frames. I will be cleaning them out in the next few days so that they'll be ready for some fresh crops. I'm a bit late this year, but that's ok. The lovely thing about gardening is simply finding your own rhythm and having fun. 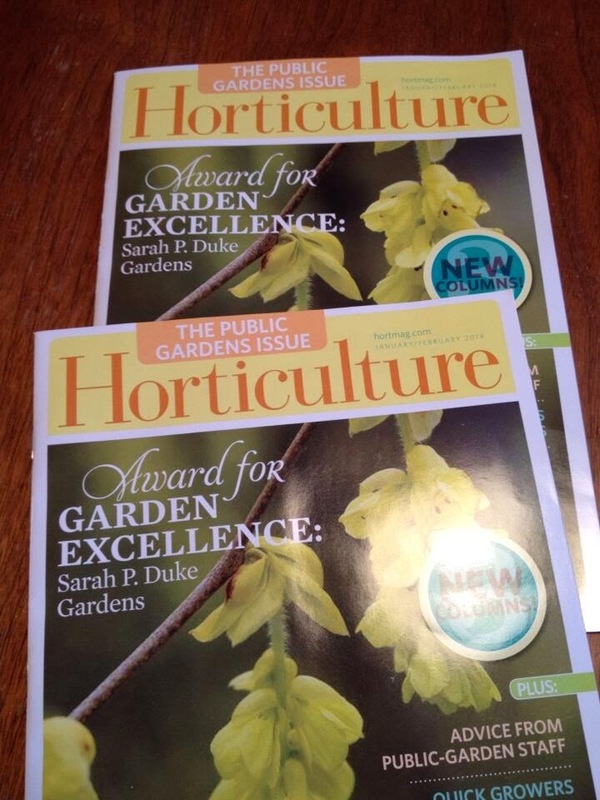 This has been a busy year for me and the garden has unfortunately been a bit neglected in recent weeks. But my seedlings! Oh, so exciting.. I just moved some Rainbow lacinato kale, Ragged Jack kale, Baby Jade Chinese cabbage and lacinato (aka, dinosaur) kale outside to begin the hardening off process. Today they're in the shade, but over the next 5 or 6 days, they will slowly be moved into more sunlight until I tuck them into the garden in about a week. I'll keep a row cover handy in case of unexpected cold nights, but they're all cold tolerant, hardy veggies that thrive in the cool temp's of spring. 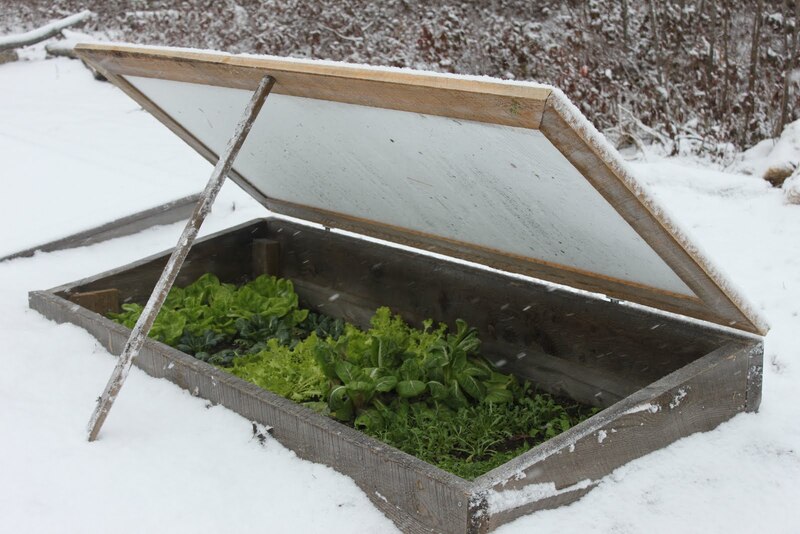 I could also move them to a cold frame to shelter them until they're ready to go to their permanent garden location. Or, cover them with a mini hoop tunnel until the weather is more settled.. 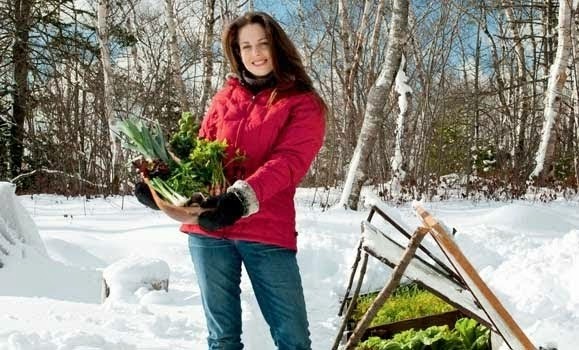 So many options for a year round veggie gardener! I also seeded another 4 flats - 5 types of zinnias from Renees Garden, a few more tomatoes (a bit late, but I couldn't resist! ), more kohlrabi, over a dozen types of lettuce, a few more gourds and way too many cucumbers! How many cukes does one need?? Well, apparently, I need a lot! We grow all our cukes up A-frame trellises which keeps the fruits clean and straight, helps prevent disease/insect problems and keeps their rampant growth under control, allowing us to grow more food in less space. The lovely Lemon cucumber. Our family favourite! Lemon - Our family favourite, this is an amazing little heirloom with rounded, light green, maturing to yellow fruits. Harvest when they are still light green though for the best quality! Plants are heavy producers and the 2 to 3 inch long fruits are excellent and never bitter. I could go on and on, but I'll just recommend that you try them yourself! 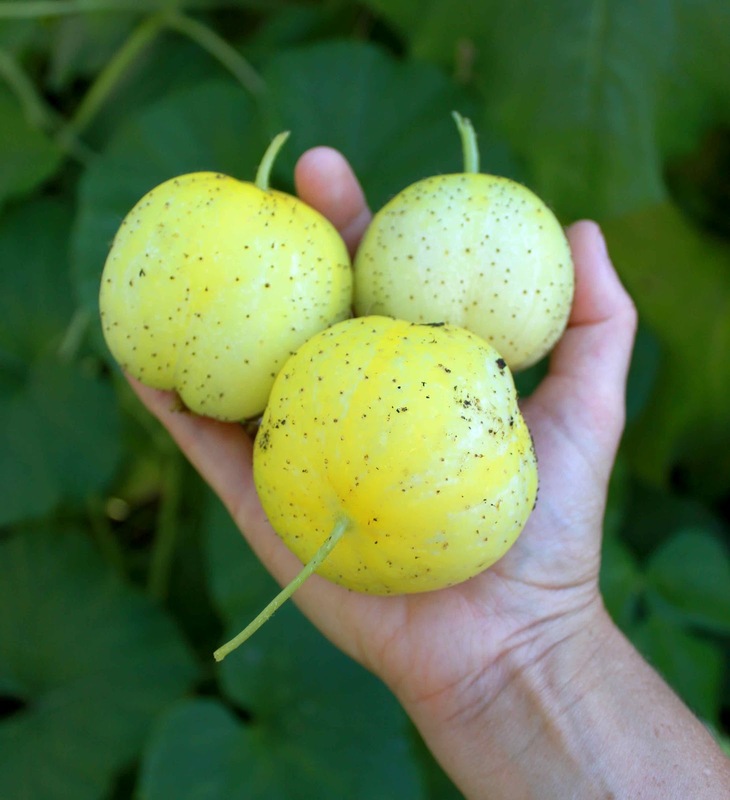 Crystal Apple - A new acquisition from Hope Seed, this is an heirloom variety that is very similar to Lemon, but it has white spines, not black. I don't think the flavour will be much different, but I'll keep you posted! Suyo Long Japanese - Strongly recommended last spring by Owen Bridge, the 20 year old owner of Annapolis Seeds, so I had to pick up a packet. We loved them! Growing up to 16 inches long, these cukes produced a good quantity of crispy, sweet fruits that will curve if grown along the ground, or hang straight if allowed to climb a trellis. We trellised ours and picked them when they were about 8 inches long - the impatient gardener couldn't wait any longer! Garden Oasis, almost ready to harvest! Tasty Green Japanese - I've been growing this hybrid for a number of years now and have found the plants to be both reliable and productive. The fruits can grow up to 10 inches long, but we tend to pick them before they reach that point. They don't need peeling, are bitter-free and the flesh is sweet and crunchy. Garden Oasis - A mid-east hybrid, this is the type of cuke sold in six-packs at the grocery store for big $$$, but they are extremely to grow at home. Each plant will bear dozens of glossy fruits, that are best picked when just 5 to 7 inches long. 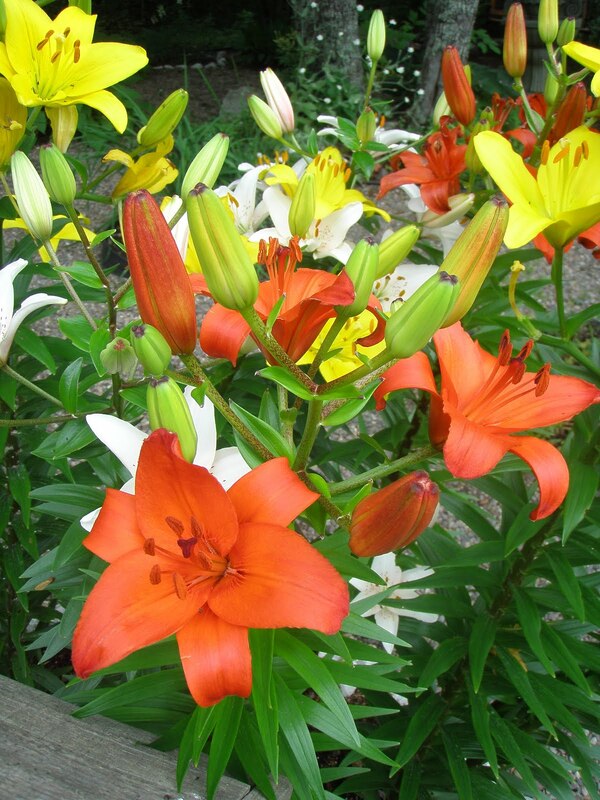 The productive plants are also very disease resistant. More Lemon cukes - and my hand. Typical Niki photo! Armenian - We've been growing these melons for a handful of years and I think that the above mentioned Melonie is going to be very similar. Marketed as a cucumber because of its shape and cool, mild flavour, these really are tasty. 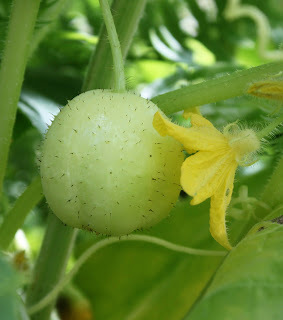 Because they are botanically a melon, they do best in a hot summer (good luck with that!) and they can be hit or miss.. last year was a miss, but the year before, we were swimming in them! Sigh.. Definitely worth a try. Little Tyke - Another new one for me, I was just given a sample of this seed from a local company and asked to give them some feedback. From what I understand, the plants are extremely early - often just 35 days from planting and bear a bumper crop of petite fruits that are most often used for pickling. That isn't going to happen - no pickling skills (yet!) 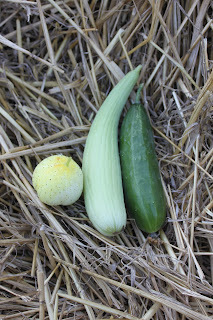 - but I think we'll still enjoy these fresh from the vine..
What are your favourite cukes?? I have cucumbers including lemon cucumbers under my lights right now. I thank you for your recommendation. I can't wait to taste them. I want to make dill pickles this year too. So, how many cucumbers do you need? How many have you got room for? Did you have a mild winter up there in Canada too? Here in Michigan we had such an "easy" winter, I am concerned what that might mean for the summer growing season.